Family Stories. In recognition. Not all the fighting took place in the battlefields. As you will remember I have shared with you on several occasions stories of my family (two of my mother’s uncles, Josep and Conrado Miret) and their involvement with the Republican cause in Spain, their exile in France, and their deaths. Recently reading the post of another writer where she followed and shared an initiative to collect family memories of relatives who had fought in the two World Wars (here is the link to Sarah Vernon’s post in First Night Design: http://firstnightdesign.wordpress.com/2014/06/19/first-night-design-my-letter-to-an-unknown-soldier/) I reflected that my country had not been directly involved in either, but of course, that doesn’t mean many did not play a part. My cousin Joan Molet is involved not only researching the family history but also trying to preserve the memory of the many men and women who although also fought (for their countries and for others also under attack) due to their lack of direct affiliation, in some cases seem to have been lost to history. Luckily through the effort of organisations and individuals those memories are being treasured and official recognition is finally coming. The situation of the ‘interns’ was complicated; some eventually returned to Spain, some, the majority, managed to get out of the camps, and were mobilized under military command in Companies of Foreign Workers (Compagnies de Travailleurs Étrangers), which were used for hard work with almost no pay. A significant proportion became involved in the fight against the German Army after they invaded the French territory, and also against the Vichy regime. 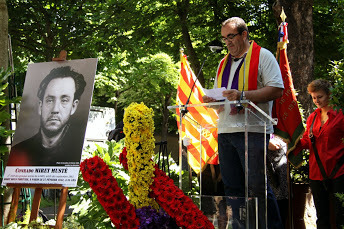 After three years of hard struggle against fascism in Spain the Spaniards were very experienced, this allowed them to organize themselves very quickly and some became leaders of resistance groups, such as my uncle Conrado Miret Musté, first head of the groups of the MOI that fought in Paris from August 1941. 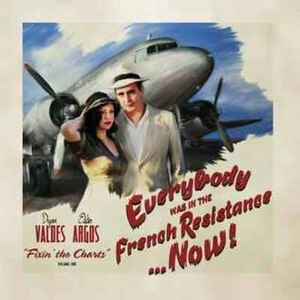 The role of those members of the resistance in the areas of France where they acted was crucial; often making the German army lose some fights, making them withdraw from their positions or with their acts of sabotage making the operations of the invading army much more difficult. In Spain I am a member of the board of Amical Mauthausen and other camps, an organization that has recently become part of the Centre for the Interpretation and Research of the Memory of Republican Spain of Borredon. Since 1962 Amical Mauthausen has been working to ensure that the memory of the Spanish Republicans — many of whom, after their heroic struggle in France were arrested and eventually imprisoned in Nazi concentration camps as was my other uncle Josep Miret Musté, who died in Florisdorff, command Mauthausen, by gunfire from SS Han Buhner, after being wounded in a bombing — is not forgotten. In conclusion, as a member also of the Amicale des Anciens Gerrilleros Espagnols in France, I want to acknowledge the work of dissemination and maintenance of the memories of combatants by the various entities that are present in this act. 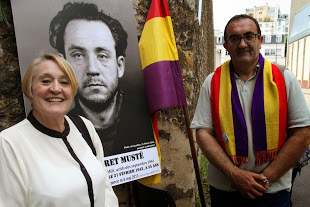 You will also remember that after years of having no official word of Conrado Miret’s whereabouts, it was confirmed that he had died in La Santé prison under torture and the city of Paris had dedicated him a plaque on the wall of the prison. The official commemoration of the plaque was the 13th of June. Joan attended with Madeleine Midon, daughter of Josep Miret. Here I leave you his words and also some pictures. 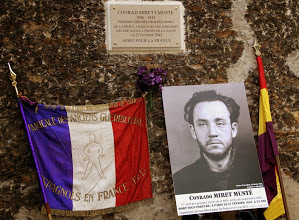 As a representative of the family of Conrad Miret Musté, first chief of the MOI FTP in Paris in 1941, I want to thank the City of Paris for placing this plaque to forever immortalize their struggle and that of all the Spanish Republican exiles in the fight to liberate France from Nazi invaders. I asked my cousin to provide me a link where people who are interested in delving further in the subject might find more information. He recommended me the page of Charles Farreny, son of an exile, and although in French, I leave it here for you. Thanks very much for reading, to Joan for sharing and if you’ve found it interesting, you know what to do, share, like, comment and CLICK. And never forget! Historias de familia. En reconocimiento. No todas la luchas se produjeron en el campo de batalla. Como recordaréis os he hablado en varias ocasiones de dos tíos de mi madre, Josep y Conrado Miret Musté, de su participación en la República Española (y en el gobierno de Cataluña), de su exilio a Francia, su lucha con la resistencia, y su muerte (Josep en un campo de concentración y Conrado en una prisión, la Santé, en París). El papel de dichos resistentes en las zonas en que actuaron en Francia fue de vital importancia, logrando en muchos casos que el ejercito alemán fuera derrotado, tuviera que retirarse de sus posiciones o bien efectuaron actos de sabotaje que dificultaba la operatividad de dicho ejército. En España soy vocal de la junta de Amical de Mauthausen y otros campos, entidad que recientemente ha pasado a formar parte del Centro de Interpretación e investigación de la Memoria de la España Republicana en Borredon. Desde 1962 Amical de Mauthausen viene trabajando para que no se olvide la memoria de los republicanos españoles, muchos de los que, tras su heroica lucha en Francia fueron detenidos y acabaron prisioneros en campos de concentración nazis como mi otro tío abuelo Josep Miret Musté, fallecido en Florisdorff, comando de Mauthausen, por los disparos del SS Han Buhner, tras caer herido en un bombardeo. Para finalizar, como miembro que también soy de Amicale des Anciens Guerrilleros Espagnols en France, quiero agradecer el trabajo de difusión y mantenimiento del recuerdo de los combatientes que realizan las distintas entidades que están presentes en este acto . VIVA LA REPUBLICA! VIVA FRANCIA! Os había comentado hace unos meses que finalmente habíamos obtenido confirmación de que Conrado Miret Musté había fallecido en la prisión de la Santé (torturado) y el gobierno Francés había reconocido que había muerto por Francia, y habían colocado una placa en el muro de lo que había sido la prisión, no solo en su memoria sino en la de tantos que por allí pasaron. El día 13 de Junio tuvo lugar la conmemoración oficial de la placa, y Joan, acompañado de Madeleine Madon (hija de Josep Miret) asistió y dio las gracias. Aquí os dejos unas fotos y lo que dijo. Como representante de la familia de Conrado Miret Musté, primer jefe de las MOI en Paris en 1941 quiero dar las gracias al Ayuntamiento de Paris por la colocación de esta placa que para siempre inmortalizará su lucha y la de todos los republicanos españoles en el combate por liberar a Francia del invasor nazi. Gracias a todos por leer, a Joan por compartir, y si os ha parecido interesante, no os olvidéis de darle al me gusta, comentar, compartir y hacer CLIC. Y no olvidéis jamás. Conrado Miret ya tiene placa conmemorativa!/ Conrado Miret has a commemorative plaque! Hola a todos. Recordaréis que os he hablado varias veces sobre los tíos de mi madre, Josep y Conrado Miret, que dejaron España a finales de la Guerra Civil y lucharon con la resistencia Francesa. Mi primo Joan Molet lleva mucho tiempo documentándose sobre el tema y se ha interesado especialmente por las historias de muchos luchadores republicanos españoles . El año pasado, tras mucho tiempo de intentar verificar lo que le había pasado a Conrado, por fin se encontró un documento que confirmaba que había muerto (torturado) en la prisión de la Santé (en París) el 27 de Febrero de 1942. Y tras esfuerzo conjunto, ahora hay una placa conmemorativa donde estaba ubicada la prisión, para recordar el hecho. 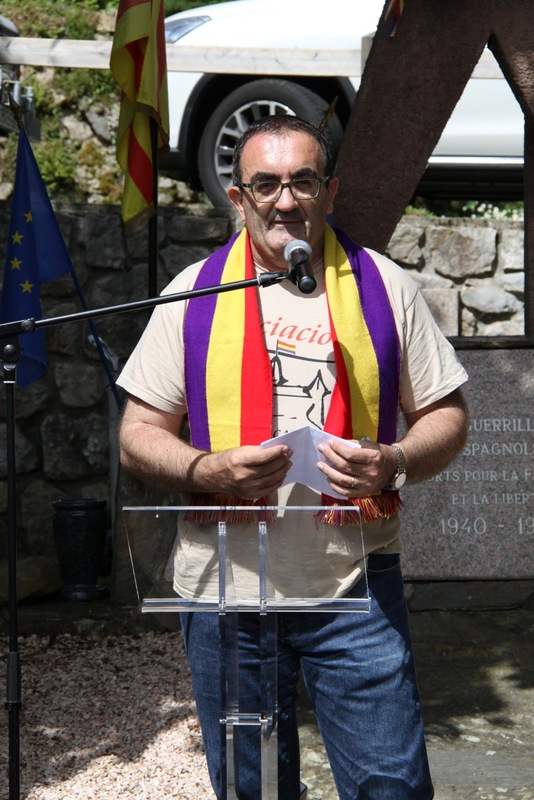 Os dejo una foto de Josep en el frente de Aragón (en primer plano con las botas, sin gorro). Companys, con el sombrero, a su lado. Gracias por leer y por seguir los acontecimientos, y espero poder dedicar más tiempo a compartir información sobre el tema dentro de poco. Y si os interesa, dadle al me gusta, comentad, compartid. If you’ve read some of my other posts about my mother’s uncles, Josep and Conrado Miret, you’ll remember they left Spain towards the end of the Civil War and passed to France where they fought with the French Resistance. My cousin Joan Molet has been working hard researching the history of the family and has managed to trace back a number of documents. Through his insistence (and with the help of others interested also in the history and fate of many Republican fighters) it was finally confirmed that Conrado had died (tortured) in the prison of la Santé (Paris). Now, there is a plaque on the site of the old prison to commemorate Conrado and with him the fate of many of the fighters of the French Resistance. I leave you a link with a copy of the picture of the plaque above. 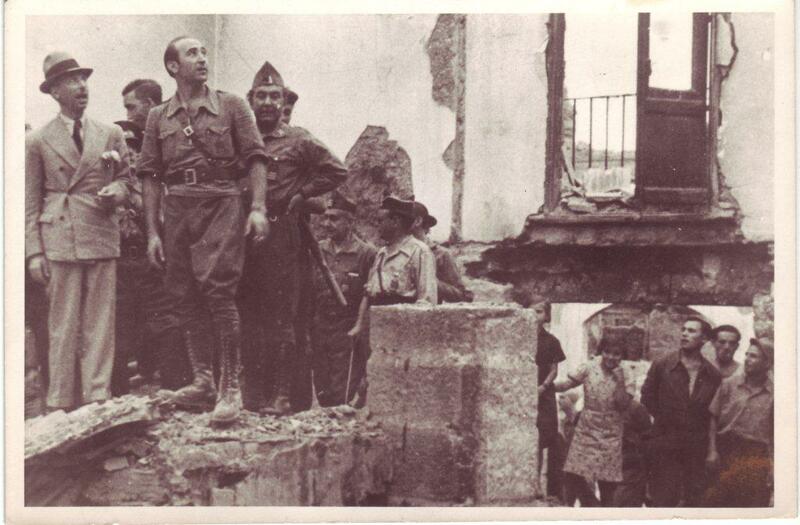 I also include a picture of Josep Miret in the Aragon Front during the Spanish Civil war (with President of Catalonia, Companys). Thanks for reading and if you’ve enjoyed it, remember to like, comment and share. Family Stories. Conrado Miret Musté. He died for France, officially! I have written a few posts about two of my mother’s uncles, Josep and Conrado Miret Musté, who fled Barcelona during the Civil War and went to France. You’ll remember one of my cousins, Juan Molet, has been researching documentation regarding their lives (and deaths) but so far he had not been able to find confirmation that Conrado died. 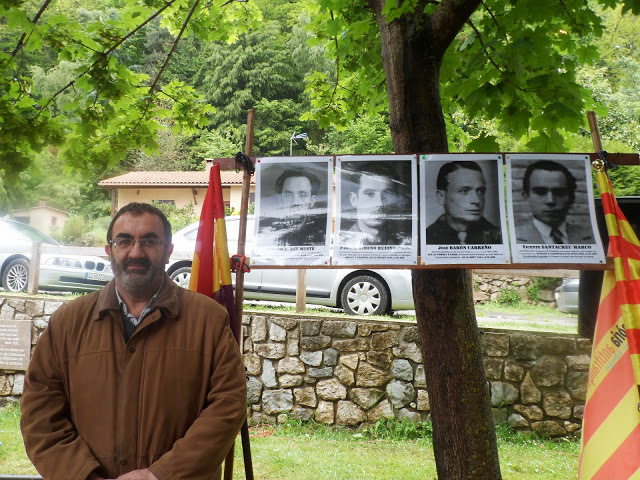 Juan participated in a homage organised in honour of the Spaniards who fought with the French Resistance in Prayols last weekend. Here it was revealed that finally a document had been found confirming that he had died on the 27th February 1942. I attach the document that gives few details, other than there was a witness statement by one of the guardians of the prison (Rue la Santé 42) . It seems indeed he died under torture. Now, with this document, he finally has been given the status of having died for France. I also attach copy of the picture they officials used to search for him. I find it quite haunting, but it might be the family thing. And here my cousin in front of the picture. He mentions that he had a chance to talk to Ángel Álvarez, member of the Republican Army (Exercit Popular de la Republica), member of the Resistence in France, and the first Spaniard who managed to escape from the train taking him to Dachau. My cousin explains that his was a sad but illuminating story. I’m hoping I’ll be able to meet my cousin when I visit Barcelona in September and I will bring back some more information and insights to share. Thank you for reading and please share. And if you have any relevant stories or information, do let me know.